The piece was published in the January/February edition of Foreign Affairs - the official magazine of the Council on Foreign Relations. 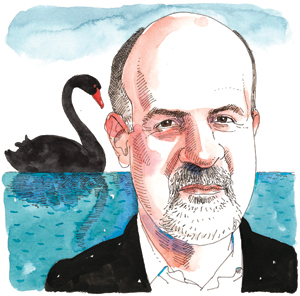 In their essay, Taleb and Treverton highlight five characteristics that could help identify states that - while appearing stable on the surface - may actually be quite fragile. “Fragility”, they write, “is aversion to disorder”. Under this criterion they view Italy as a stable state. With regards to centralised decision making the article points to the autocratic Arab states which while appearing strong on the surface quickly succumbed to the “Arab Spring” uprisings before degenerating into chaos - albeit compounded by external influences. “Although centralization reduces deviations from the norm, making things appear to run more smoothly, it magnifies the consequences of those deviations that do occur. It concentrates turmoil in fewer but more severe episodes, which are disproportionately more harmful than cumulative small variations. Other states they look at are Middle Eastern, African and China. Recent events would suggest that EU is increasingly centralising authority and decision making in Brussels. Indeed, Greek Prime Minister Alexis Tsipras recently stated that Greece’s creditors had made it clear that bailed-out countries had no right to self determination. In terms of economic diversity, the authors warn of the risks associated with over-reliance on a particular sector such as tourism and on a single commodity or industry. The cite Botswana’s over-reliance on the diamond trade and Japan’s car manufacturing sector. An African country that is completely reliant on cocoa production, for example, is vulnerable to the predations of large confectionary corporations who can demand unreasonably low prices leading to hardship, poverty and civil unrest. The U.S. is slightly vulnerable in this regard having relocated the bulk of its manufacturing sector overseas in recent years although it remains well diversified. Since the 2008 crisis - caused by excessive debt - global debt has increased by one third. In May the McKinsey Institute reported that total global debt was now around $199 trillion - $27,204 for every person alive today. The U.S. is particularly vulnerable in this regard. It’s total Federal debt is over $18 trillion while its GDP is estimated to be $17.71 trillion. At the same time its unfunded liabilities are estimated to be a more than a staggering $100 trillion - a sure source of instability as these payments come due. According to the authors, political variability contributes to stability “by responding to pressures in the body politic”. While western leaders like to promote the notion of political pluralism it is clear from the consistently low levels of participation of voters at election time that the people who live with the consequences of their decisions that the public do not generally see credible alternatives. It becomes increasingly apparent that decisions are made by lobby groups and vested interests only to be rubber stamped by governments of varying persuasions. How the fifth characteristic pertains to the western world is more difficult to identify. What constitutes a major shock and what constitutes a survival of a shock? Can the Western world be said to have experienced a major shock in the post war period prior to the 2008 crisis? Can they be said to have survived that shock when in reality they appear to be on life-support? It is true that the powers that be have done a remarkable job at averting the day of reckoning but does that constitute a track record of surviving shocks? The authors believe that exposure to any one of these factors is a symptom of instability. They add that exposure to multiple factors presents an exponential increase in risk. The wider public and the press seem unjustifiably complacent at this time. It seems likely that the seemingly unending “recovery” is simply the calm before the storm. Today’s AM LBMA Gold Price was USD 1,115.75, EUR 1,047.58 and GBP 739.09 per ounce. Yesterday’s AM LBMA Gold Price was USD 1,153.20, EUR 1,046.89 and GBP 745.27 per ounce. Yesterday, gold fell $2.70 to $1,155.20 an ounce and silver slipped $0.12 to $15.38 an ounce. Gold in Singapore for immediate delivery traded sideways as did gold in Switzerland. Silver for immediate delivery was 0.2 percent lower at $15.41 an ounce, dropping for a third day. Spot platinum climbed 0.5 percent to $1,031.51 an ounce, while palladium advanced 0.6 percent to $656.95 an ounce.